Feature: Is Rooney the answer? Manchester United have revealed they had no plans to sign Wayne Rooney until Newcastle made a bid for the striker. United boss Sir Alex Ferguson said he had held talks with Everton boss David Moyes about signing the England teenager at the end of last season. But Ferguson said: "If Newcastle hadn't come in with an offer, we probably wouldn't have come in. "We didn't think he was available. But once we knew Everton were talking to another club, we had to do something." 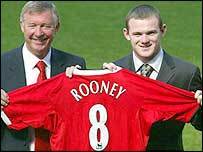 On Tuesday, Rooney signed a six-year contract which will tie him to Old Trafford until 30 June 2010. And on Wednesday he admitted he had made the decision to leave Everton six weeks ago after an impressive display at Euro 2004. Rooney said: "I made it clear that I wanted to leave Everton. Once I knew Manchester United were interested, there was only one place I was going. "I knew that I wanted to further my career and play in the Champions League. "After Euro 2004 I made up my mind that I had to get to a bigger club. I wanted to play with the big players week in, week out." Rooney's move from Merseyside has led to a heavy backlash from the Liverpool public, with abusive graffiti in various places in the city. And the 18-year-old admitted it had been a difficult time. He said: "It's been a tough week for everyone concerned with me. It was difficult because I've supported Everton all my life. I'd played there for two years which made it even more difficult. "It's tough for Evertonians because I'd come through and they saw me as their own. But I wanted to move on with my career." Ferguson said he had been closely watching Rooney since he was a 14-year-old and that he was excited about the players' potential. "His age is a great thing," said Ferguson. "And Manchester United couldn't afford to miss him." United's boss also said he was likely to play Rooney, who he said was two to three weeks away from fitness, behind a striker.